The best calculator for Android. Easy to use, intuitive and functional, it's the only calculator that really allows work with fractions. With 5 beautiful themes and three screen layouts that fit any need. Designed to be useful to anyone, from kids to grown-ups, so whether you are looking for a basic or advanced calculator. Excellent for schoolwork, college/university studies, sciences, engineering or anything else you have in mind. King Calculator got accepted to the Google in education program and is being used in schools in the United States as an educational tool. Our unique flexible display allows you to input and edit everything on the screen, with syntax highlighting to ease your work. Handle complex expressins with brackets/parentheses, mathematical operation priority, mathematical functions and fractions. If you choose to work with the scientific display, you will enjoy a fully functional scientific calculator that can even draw graphs of functions. Your calculations and their result are automatically saved in and available using the history screen, you can view use previous expressions if you like. 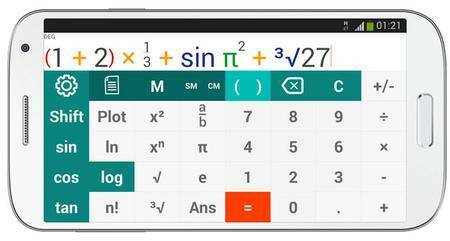 Great for calculus and algebra courses in school or college. Material design layouts are included. The app is free and will always remain free. • Ans button, that saves the last result for the next expression. • Exponents, you can raise a number to any power. • Absolute value function and more.